What is the Repair Service phone number? How do I REBOOT my modem? Disconnect the modem’s power plug from the outlet, wait 3 mins and connect the power plug back into the outlet. 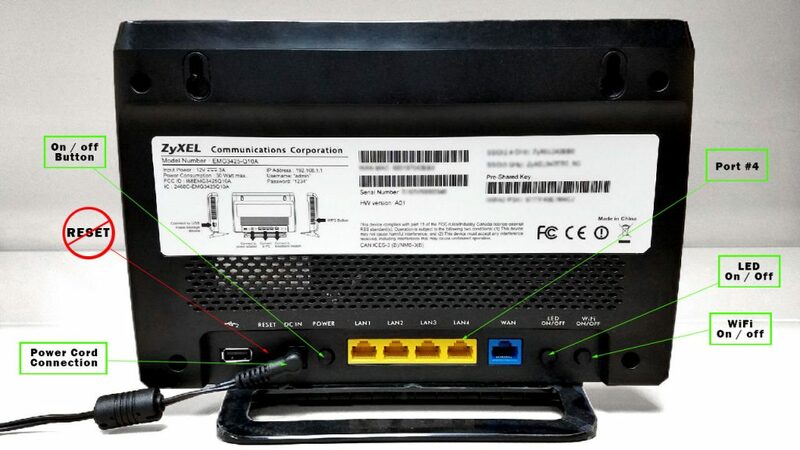 Allow the modem to completely connect before testing your devices (PC, tablet, mobile phone), for connection. If you have your own router such as Netgear, Linksys, Cisco, Belkin, etc… you will need to call that router company for assistance. If you rent our BTC wireless you will need to call repair to get it changed. How do I check my internet speed? NOTE: Make sure you have only one device hardwire connected to port #4 in the back of the modem during the speed test and that no other devices are connected thru hardwire or WiFi. My WiFi isn’t working through my router. What can I do? 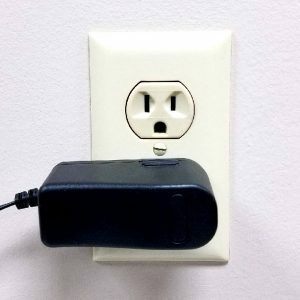 Reboot the router by unplugging the power cord from the wall outlet. 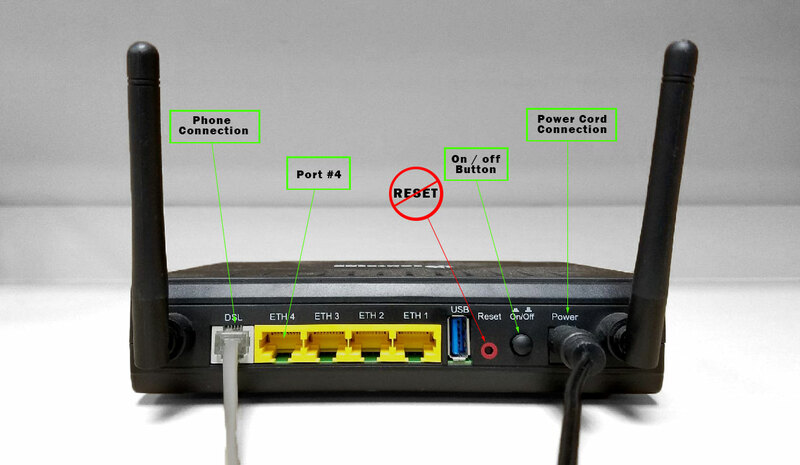 If that fails you can plug a computer directly in port four (See “Port #4” in photo) on our modem. If there is no connection, restart the computer. ** NOTE: Never use the “Reset” to reboot or restart the modem! My fiber is not working, what can I check? Check battery backup and make sure you have a green light. 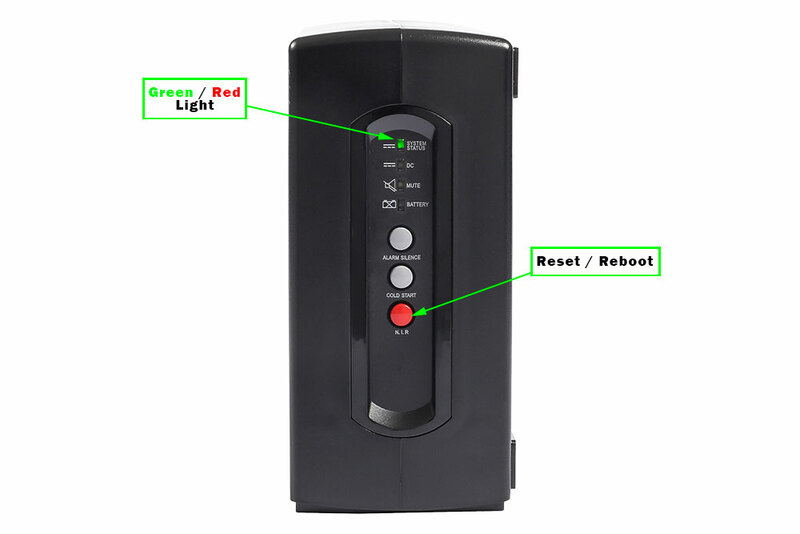 If you have a red light on the battery backup check the GFCI wall outlet and press the “Reset” button on the wall outlet and you will hear a beep and the light on the battery backup should turn green. To reset the battery backup press and hold the “RED” reset/reboot button for 5 seconds. When you hear the unit beep twice release the button. How can I get a new IP Address for my device? Unplug the power plug from the outlet, then wait 60 mins and plug the modem power plug back into the outlet. This will give a new IP Address to your device. My TV says no signal, what do I do? Make sure you have a blue light on your STB then if the TV still says no signal check your inputs by pushing the “TV” button on the remote then input. My IPTV is out and I have a red light on my STB (Set Top Box), what do I do? Push the STB button then power or you can reboot the STB by pulling the power cord out and wait for about 10 sec then plug back in. What can I do when I can’t change channels? 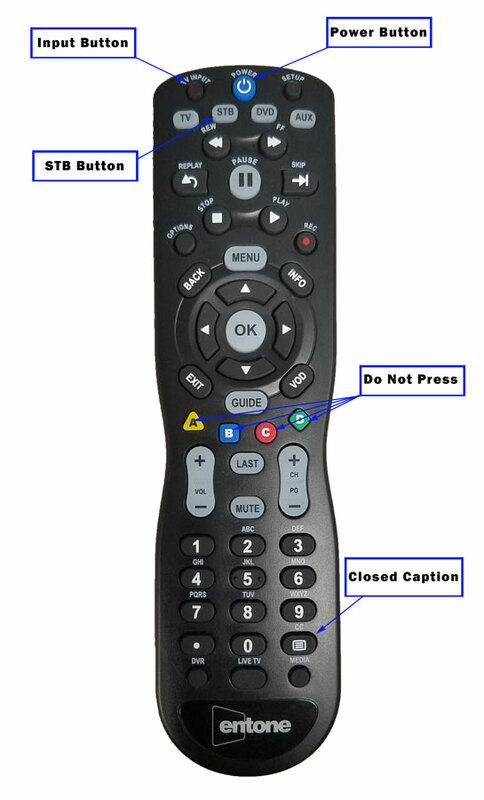 Push STB on the remote or reboot STB by unplugging the power plug (smallest black cable) from the power outlet and replug after 3 minutes. My T.V. says enter in host IP, what do I do? Make sure you do not have the Ethernet cable going into port 4, (Port 4 is for internet only). The T.V. Ethernet cables should plug into ports 1, 2 or 3. What can I do when my IPTV is tiling or freezing? Reboot the modem by disconnecting the modem’s power plug from the outlet, wait 3 mins and connect the power plug back into the outlet. Allow the modem to completely connect before testing your devices (PC, tablet, mobile phone), for connection. ALSO, reboot STB by disconnecting the power plug (smallest black cable), from the power outlet and reconnect it after 3 minutes. What if my IPTV says “failed to retrieve IP address from DHCP server" or "Ethernet not detected"? Why is my Netflix is not working? Please make sure you do have internet on another device and call Netflix’s support. Netflix is a separate service that is not through Bledsoe Telephone. How do I turn on or off the Closed Caption? 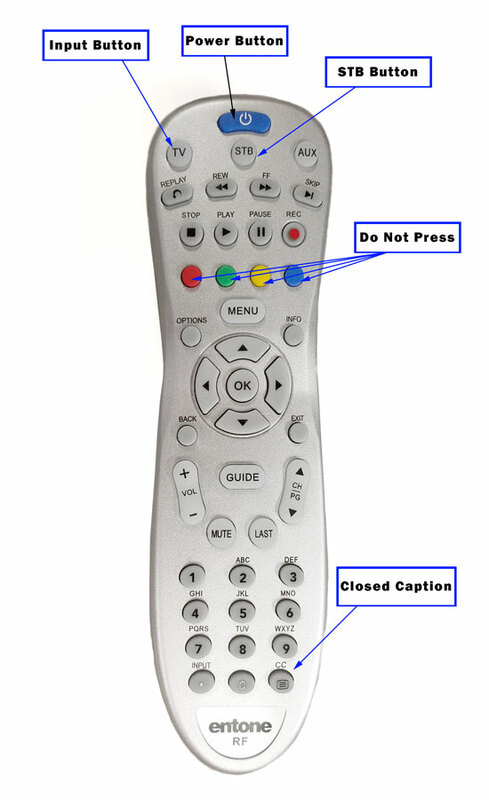 Press the Closed Caption button marked “CC” on the remote until it reads “Closed Caption Off” on the TV. How do I access the caller ID log on my TV? Before starting please be sure to know your email address and password. • If you are unsure, please contact Bledsoe Telephone Cooperative during business hours at (423) 447-2121. If you are unsure, please contact Bledsoe Telephone Cooperative during business hours at (423) 447-2121.
email account. As different versions of Apple Products have different layouts. 1. Go to Settings > Passwords & Accounts > Add Account. 2. Tap Other to add your account manually. 3. Enter your name, email address, password, and a description for your account. 5. Choose IMAP for your new account. Replacing the Username and Password, with your Full Email Address and Password. 8. If your email settings are correct, tap Save to finish. If the email settings are incorrect, you’ll be asked to edit them. If you’re asked to edit them, please review the entries and try to Save again. If you are having trouble setting up your email account or saving your email settings, please call Bledsoe Telephone Cooperative at (447)-447-2121. • Note that these steps are intended to provide guidance on setting up a Bledsoe.net email account. Please Note: Email address, username, and password should be auto-filled. Go to the section for the IMAP server settings. If connecting the email account fails: please review the settings and try again. a. Note: Review the entered email address to ensure it is free from any typos before continuing to the next step. If any typos are found, please correct before going to the next step. a. If there is a message in regards to not being able to set up the email account. Review the entered email address and password. 1. Review to see if the entered email address is entered correctly. 2. Re-Try entering in the password. 4. Once the steps above have been completed, Tap Next to re-try creating your email account. If you are experiencing trouble setting up your email account or saving your email settings, please call Bledsoe Telephone Cooperative at (447)-447-2121. 1. The feature of adding additional emails is only available when logging in with your master email account. The first email that was set up on your account. 2. Depending on your current internet package determines the number of available additional emails. 1. Type in mail.bledsoe.net into the address bar in your browser and hit enter. Select Mail Settings in the drop-down menu. 4. In the “Mailbox Management” section click on New Mailbox button. Note: If you do not see the button for New Mailbox, then you’re currently logged in as a secondary email account. Please log into your main or master account to have access to adding an additional email. 5. In the “Create Mailbox” section, here is where the new mailbox will be setup. Enter an Email Address that you’d like to use. Enter the new Password you want to use for this email address. Note: This is for confirmation and a safety measure to ensure the accuracy of the password without any intended typos. This feature is to create a new mailbox under your account. The Password for the new mailbox, it’s suggested to be a minimum of 8 characters in length. The Email Address / First Name / Last Name must start with either a letter or a number. Note: If planning on using more than one device, only use the IMAP Settings. What can I check if my phone is saying line in use? Make sure all phones are on the hook. Then you need to unplug all CPE, such as cordless phones, alarm systems or satellite dish, then plug another phone in a jack to see if you have a dial tone. Call support if you still have no dial tone.